It was one month shy of a quarter century since I had last been here. Easter week in 1987 we – my wife, our 7-year old daughter, and our 2-year old golden retriever – pulled into the lee of the 700+ foot tall Eureka Sand Dunes in our 1972 International Scout. The only other person there was some bozo riding a 3-wheeler on the lower dunes, fortunately in the distance. There was no campground, certainly no outhouse, and in fact Death Valley was still a Monument and its boundaries did not yet extend to this lonely and remote valley. Against a crystal blue sky we climbed the highest dune and later that night relished a warm evening beneath a canopy of limitless stars. Fast forward 299 months…the Scout is long gone, Whiskey – our first golden retriever – lived a long life but is also no longer with us, our daughter is grown up, my wife was at home, and me and my friend / photography-partner finally arrived after a 10+ hour drive at the primitive Eureka Valley campground on this cold, cloudy March afternoon. 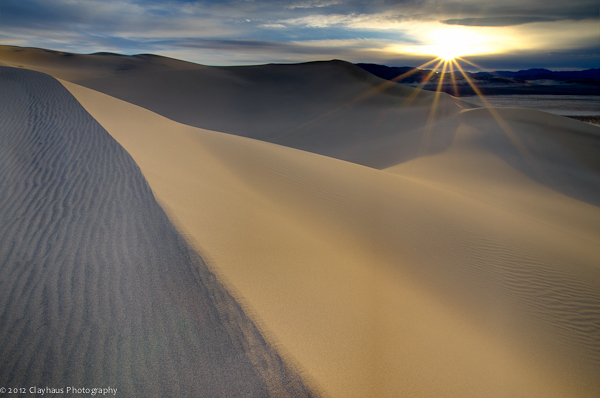 Death Valley National Park extended its borders a decade-and-a-half-ago to include this valley, as well as Saline and Panamint Valleys. Other than fourteen or so widely scattered campsites, and the one lone sentinel of an outhouse, it was hard to see any difference in what I remembered from 25 years ago. Oh yes, no bozos are permitted to ride their toys on the dunes…progress. It was chilly but after selecting a site and setting up camp, we ventured into the lower march of dunes to photograph a sandy sunset. 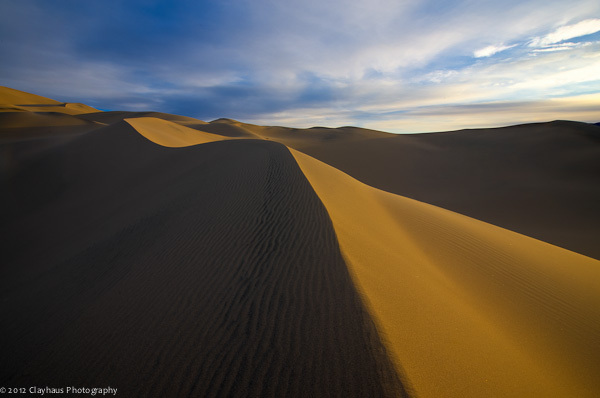 Little time remained before the sun dipped below the horizon, and my goal was to hike high on a dune ridge to a) be beyond any traces and tracks of human footprints – always a challenge in the dune environment – and b) be positioned appropriately to capture the waning light on the dunes. It didn’t take me long to clamber high enough to reach a stretch of virgin sand, long with sinuous cascades of ripples. The clouds played havoc with the light – a muted softbox effect punctured by occasional bright bursts of the sun and its light – and ultimately yielded little in the way of dramatic and classic sunset colors. Nonetheless, there were brief windows when things worked and the elements came together to create interesting images: a knife-ridge here lit by golden light on one side, shadowy dusk descending on the other; a thin, struggling bush there acting as an organic counter-point to the mountains of silky silica. 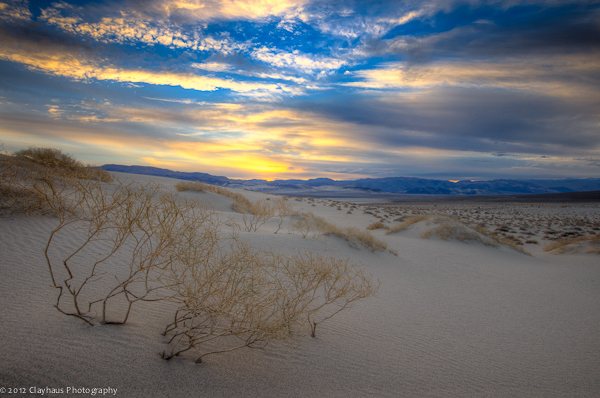 I concentrated on those moments and subjects, attempting to distill the essence of cool spring dusk turning into the winter of a cold, starry night; trying to do justice to the power, beauty, and serenity of the desert environment.